Update 2017-08-25 | Changed the way the output from a button click is handled, saving it to a variable instead. The humble VBScript message box has been around for a while now and is still a useful way of providing a simple pop-up notification in Windows. I’ve used it in my PowerShell scripts as well as my UI tools and even in my ConfigMgr task sequences for providing feedback to the end user. Both WinForms and WPF also have a message box but they have similar style and functionality to the VBScript version. In this age of modern design languages like Metro and Material Design however, this message box is starting to look a little dated. So I decided to create my own customizable message box in WPF as a PowerShell function that can be used in my scripts and UI tools. Enter New-WPFMessageBox. My goal was to create a good-looking, fully-functional message box window that is highly customizable in the WPF format, and can even be used as a window host to display custom WPF content. The message box has a basic default design, but if you’re the creative type then you can customize away until you get an appearance you like. Let’s have a look at some ways we can use this function. New-WPFMessageBox -Content "I'm a WPF Object!" The Content parameter is the only mandatory parameter, and can take either a simple text string or your own custom WPF content (which we’ll look at later). New-WPFMessageBox -Content "I'm a WPF Object!" -Title "Custom Message Box"
The title bar is a color block, so it can be used to create a nice contrast with the main content, for example. Use the TitleBackground parameter to change the color. This parameter is a dynamic parameter and will allow you to select from the list of available colors in the .Net palette. You can change the fonts, font weights and font sizes, as well as the background and foreground colors to create some nice combinations. The FontFamily parameter is also dynamic and allows you to select from fonts available in .Net. The Content… parameters allow you to change the main content section, and the Title… parameters allow you to change the title. Content = "I'm a WPF Object!" Title = "Custom Message Box"
The default button is the OK button, but you can also use other buttons or button combinations such as Yes/No, Retry/Cancel, Abort/Retry/Ignore etc. Simply select an option using the ButtonType parameter. Content = "The file 'Important Document.docx' could not be deleted." Title = "File Deletion Error"
Content = "The purchase order has been created. Do you want to go ahead?" CustomButtons = "Yes, go ahead! ","No, don't do it! ", "Save it for later"
You can create Information, Warning or Error message boxes using your own style. If you define the parameters once in your script, then you can simply call them everytime you want to display that message type. New-WPFMessageBox @InfoParams -Content "The server has been rebooted at 08:35 on 16th January 2017"
New-WPFMessageBox @WarningParams -Content "The file could not be opened." New-WPFMessageBox @ErrorMsgParams -Content "There was a problem connecting to the Exchange Server. In this one I’ve added the Sound parameter. This is a dynamic parameter allowing you to select from available Windows sounds in your local media library. The sound will be played when the message box is displayed. New-WPFMessageBox @ErrorMsgParams -Content "$_" -Title "PSSession Error!" In this code, I am using a try / catch block to catch an error, then using the message box to display it. New-WPFMessageBox @Params -Content "The script ran into a problem that it couldn't handle, and now it needs to exit. If you prefer square corners and no window shadow effect for a more basic look, try this. Here I have set the CornerRadius, ShadowDepth and BlurRadius to 0, as well as setting the BorderThickness and BorderBrush parameters to create a simple border. New-WPFMessageBox @Params -Content "The server is not online. Do you wish to proceed?" New-WPFMessageBox @Params -Content "The server is not online. Do you wish to proceed?" Timeout is a useful parameter which allows you to automatically close the message box after a number of seconds. You might want to use this in a script where you choose to continue if no response was received after a period of time. You can also use this to simply display a message without any buttons – just for information, and no response is required. $Content = "Your mission - which we have chosen to accept for you - is to eliminate Windows XP in the enterprise. This message will self-destruct in 30 seconds"
I’ve also added a couple of parameters that allow you to assign code to the Loaded or Closed events on the message box window. This means you can run code when the message box opens, or after it has closed. Simply pass a code block to the OnLoaded or OnClosed parameters. Bear in mind that any code assigned to the Loaded event should not be long running as it will block the thread until it has completed, and the message box will only display afterwards. In this example, I have used an async method from the SpeechSynthesizer class so that the text will be spoken at the same time the window opens because it is not running in the same thread. $Content = "We could not access the server. Do you wish to continue?" As well as a simple text string, the Content parameter can accept a WPF UI element. When you pass a text string, the function simply creates a textblock element and adds the text. But if you know a little about creating WPF objects in PowerShell, you can create your own elements and add them as content to the message box. This opens up a lot of possibilities and transforms the message box into a kind of easy-to-create window host for any WPF content. For example, instead of some text, how about displaying a picture instead? To set the height and width I have simply halved the dimensions of the source image file. Maybe you want to add a text description of the picture too. In that case, create a textblock and add both the image and textblock to a layout control like a stackpanel, and pass the stackpanel as content. $TextBlock.Text = "My friend Robert"
How about playing a video? New-WPFMessageBox -Content $MediaPlayer -Title "Windows 10 In The Enterprise"
We could also add some buttons to control playback. I’ve added the buttons to a dockpanel, added both the video player and the dockpanel to a stackpanel, as use the stackpanel as content. New-WPFMessageBox -Content $StackPanel -Title "Windows 10 In The Enterprise"
$TextBlock.Text = "The file could not be deleted at this time!" How about including an expander for an error message box, with the error details available for viewing when expanded? $TextBox.Text = "Could not create a remote session to '$ComputerName'!" You can also ask the user for input and return the results to a variable in the containing script. For example, here I am simply asking the user to select an option from a drop-down list. The selection will be saved to a variable that can be used later in the script. $TextBlock.Text = "Select your location from the list:"
If your script returns data in table format, how about using a WPF datagrid to display it in a nicer way? You can populate a datagrid from an array, but I recommend converting to a datatable object as it’s a type that fully supports the features of the datagrid. In this example, I’m simply displaying services on my system from the Get-Service cmdlet. Title = "Services on $Env:COMPUTERNAME"
How about using a TreeView object to group the services by status? New-WPFMessageBox -Content $TreeView -Title "Services by Status" -TitleBackground "LightSteelBlue"
If you want to use the message box function in your own WPF UI tool, then you can use the WindowHost parameter to pass the host window object. This will make the host window owner of the message box window, and means your message box will always display centered in the host window, no matter the size or location of the window. In this example I have created a simple host window with a big “Click Me” button. When clicked, a message box will display. My final example is a bit more advanced, but it demonstrates how the message box could be used in a more dynamic way to display output from code running in a background job. I’ve created a stackpanel from XAML code containing a textbox and a button. These are all added to a synchronized hash table which gets passed, together with a code block, to a new PowerShell instance which runs in the background. The code block simply pings a list of computers in succession and updates the textbox in real time with the result of each ping. The background job is triggered by the “Begin” button. $UI.TextBox.Text = $UI.TextBox.Text + "`n" + "$IPAddress is online"
$UI.TextBox.Text = $UI.TextBox.Text + "`n" + "$IPAddress could not be contacted"
And I’m done. Try it out! Wauw, cool message boxes, thank you so much. Only minor suggestion to include default icons for information,warning and error messages would be nice, so I don’t need to get an external image somewhere..but now I’m just whining. Keep up your great posts, much appreciated! I’d like to try this out but I’m not seeing a link to download the code. Yep, using a browser. I think my company’s network may be blocking some things so I will try again later. Thanks. This is a great help!! Is there a way to force the WPF window to open in front of other windows? I find sometimes it pops up behind another so the user misses the message. That’s interesting, the $this.activate() line should take care of that. Another way to do it is to set the topmost property of the window, so set $window.topmost = $true just after the window object is created, then set it back to false in the $window.Add_loaded event methods otherwise the window will stay permanently on top of all other windows. Thanks Trevor, I will give that a go. could you please tell me that , where exactly in the code need to be put. Hi Billy, what error do you get? Are you using the latest version of the script? This was an issue with the first release but I corrected it to include loading the required libraries in the PS console. The current Gist is working fine for me. I’m getting the same thing. Works fine in IDE, not on console. Just updated the function from the Gist to be sure. New-Object : Cannot find type [System.Windows.Controls.Image]: verify that the assembly containing this type is loaded. Yep. What PS / OS / .Net version are you using? I’m trying to replicate your tutorial “Upgrading using an OS upgrade task sequence” and the PS script are not applying..
Where can I add this script or what exactly do I need to in order to make this “New-WPFMessageBox” PowerShell function run successfully ? (sorry I’m a newbie). Perhaps this comment belongs on the other post then. The scripts and an example task sequence are included in the download. This is great, Anyway you could add a drop down menu option that outputs the result? Do you mean like the PSSession Error example with the expander box? Probably bad wording, I mean a combo box with a list of variables where the user selects one and then the result is set as the variable. eg. I have a ts server and want users to select the location they’re at. I like this! Is there anyway to supply hex colour codes rather than the .net built in one? You could remove the dynamic parameters in the function where colours are used and instead add a regular parameter of the same name. Then you should be able to specify hex codes as well. Thanks Trevor will give it a go! Does that work for a non-admin user? Will this work on Windows 7? I can confirm that @PAUL “HARF” HARFIELD’s suggestion works. It’s a tidier way to manage the function from one just one file. Trevor, I think your tool and your examples are marvellous. I will have to study your tool properly so I can replace my current, limited-capability vbs-hta tool. 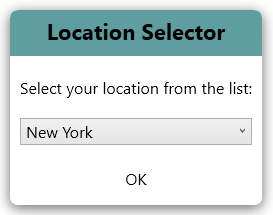 You included a dropdown list example but not a simple input box example. Am I going to discover how to use it for that as I study the tool more or is it not something you have provided for? I did find a couple of what I believe are typos in your examples. Thanks for mentioning the typos! I will update it. I don’t have any example for an input box, but that certainly could be done. Hi Graham, would you mind posting the full script. I can’t get the basic “Dynamic” code working. I’d be grateful for the help. Trevor, thank you for your prompt reply. That worked great. Nice coding. Gonna look through the rest of your site for other golden nuggets such as this. Will this work within a PXE environment during a task sequence? The boot image does have Powershell and .net 4.7 loaded. I can get the messages to work no problem on my desktop but they don’t appear during the my task sequence. Running the script doesn’t create any errors in the TS environment, it just pauses for a bit then moves on as if it ran fine without anything appearing. I wanted to add, I did discover if I just run New-WPFMessageBox -Content “I’m a WPF Object!” the message box pops up without issue in PXE. However if I add anything else at all to it, even just doing New-WPFMessageBox -Content “I’m a WPF Object!” -Title “Custom Message Box” it fails to display. Great function, was looking for this for a while :)…just one issue untill now…I can’t seem to get one or more new lines in the messagebox…it keeps putting it on one line. Even with `n…any thoughts on this? Hi, Is there a way to Format the message content text with carriage Returns and linefeeds, if the text is stored in a variable? BTW all , adding “ ” (removing the double quotes) works well for adding a newline in a variable with a string value. This is very useful. How might I include the 10 minute timer and the ability to loop the script after the ten minutes if the “Ask me again” button is pressed? Is there a way to center the text in the body of the message box? Please tell me script for displaying message box with count down time as message. Is there a way to make it mandatory to fill out a textbox or other field before you can close the popup by pressing okay button? Can anyone tell me why i get this error when running this code? Basically if i add multiple different type of objects such as textbox, listbox etc together, i can only run the popup once, if i run it again i get this error. I’ve tried adding the line: $Window.FindName(‘ContentHost’).Children.Clear() above line 386 with no luck. what to change if i want window at top left corner ? how to make video play repeatedly ..
Is there a way to get this message box to pop up on a remote pc? Is there a way, to ensure that the message box will be in front of other windows? It seems like you and I converged on solving a similar problem! Check out https://github.com/dm3ll3n/AnyBox. More of the process is abstracted away, but you do lose a bit of control with the AnyBox. Nice work with this! Hey that’s a great solution! And a nice way of adding additional content to the box using cmdlets. I really like your work on this. I wanted to use this to show a dialog with a message like “Operation in progress, please wait” but using OnLoaded and OnClosed wasn’t really working with the type of work and error management I was trying to achieve. So I did those 2 little modifications to enable the window to be shown while my code continues executing and then choose when I want to hide it back. Additionnaly, using the messagebox like that broke the usage of OnClosed because the codee steps out of the functions and loses the value of OnClosed and when it goes back to execute the Add_Closed, Invoke-Command throws an error.